Operation of the boring machine_Industry knowledge_Xinxiang Lantu Machinery Co., Ltd. 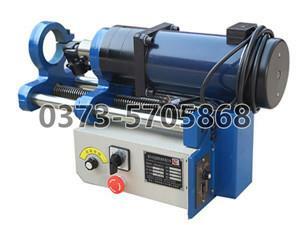 The boring machine is the main product of our company. Let's talk about its operation and application. 1. Fixed mast: The boring bar, support flange and centering cone suitable for the selection are assembled on the workpiece to be machined, the center of the mast is measured and adjusted, and the support flange is spot welded to the workpiece to be processed by the welding handle. On, the requirement: the welding is firm and stable, the centering is correct, and then the centering cone is removed. 2. Connect the multi-function boring machine main machine and cutter: bolt the main flange and the support flange with bolts, multi-function boring machine design, and ensure that the boring bar can be screwed into the threaded hole of the main motor reducer, and then connected The main motor is fastened with bolts; the split type knife holder or the insert type high speed steel blade is fastened with screws at a distance of 5-10 mm from the hole to be machined, and the small multi-function boring machine is used for the proximal boring machine. Positive knife - main motor forward rotation - feed motor forward rotation processing, the distal end hole adopts reverse knife - main motor forward rotation - feed motor reverse machining, before starting feed, adjust the tool nose position to ensure the side machining amount Within 2mm. 3. Rough: Connect the power supply, start the main motor (motor reverse rotation is disabled, only used to remove the mast), observe whether the tool nose position meets the roughing requirements; start the feed motor to feed the knife, adjust the knob to change the feed speed If the welding is too eccentric or the centering is too biased, the knife will vibrate on one side, and the processing will be smooth after the knife is eaten. The amount of the knife can be gradually increased. The multi-function boring machine can be processed according to the needs. It is better to use a knife. After each axial feed is completed, the motor should be stopped first, then the main motor should be stopped, and then the feed motor can be reversed or retracted manually; during processing, the multi-function boring machine factory, along with processing For the increase of the hole, the unilateral enthalpy and the traverse speed should be appropriately reduced; before each boring, the boring bar should be kept in the retracting stroke until the machining is completed. 4. Fine boring: After roughing, the diameter direction should be reserved for 0, 5--1, 0mm processing volume into the fine boring stage (this time should be sharpened beforehand, to sharp, and then accurately measured into the stencil, the screw is tight) If it is equipped with a sleeve, the 0, 2-0, and 5mm feeds can be selected to be stable. If you need to machine high-precision holes such as bearing positions, such as hole cylindricity and diameter tolerance, you need to pre-order standard disc milling cutter. 5. Disassemble the equipment: first unplug the power supply, then remove the tool holder, cutter, and remove the boring bar; loosen the screw between the main machine and the support flange to remove the main machine; use the angle grinder to remove the solder joint of the welding handle Lower support flange, wipe the box. Note: The mast can be hung and stored to prevent bending deformation.